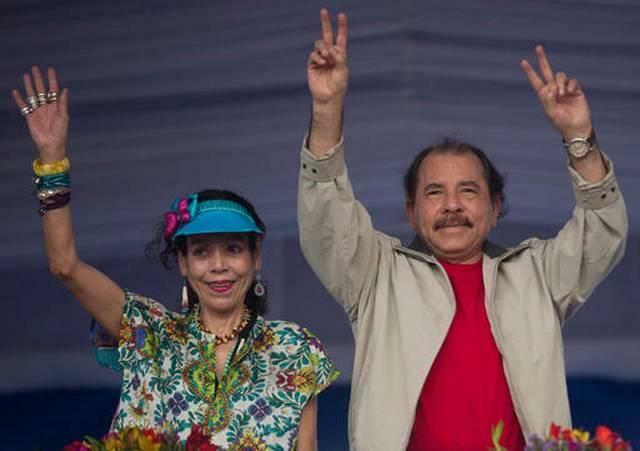 Nicaragua's President Daniel Ortega and his wife, vice presidential candidate Rosario Murillo show their marked thumbs after voting at a polling station near a their home in Managua, Nicaragua, on Sunday. 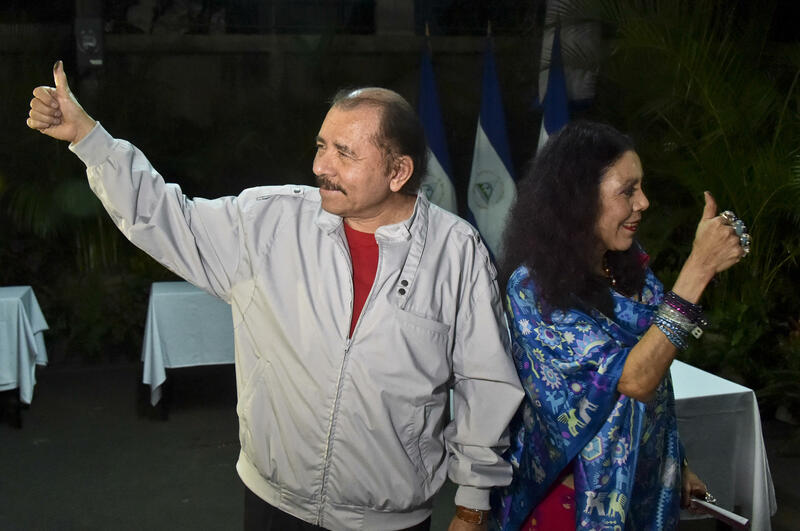 "Ortega led the country after his Sandinista rebels overthrew dictator Anastasio Somoza in 1979, until losing an election in 1990. He regained power in 2007, garnering just 38 percent of the vote, defeating a fractured opposition. And he's ruled ever since, with each election drawing more international scrutiny and mounting fraud allegations. "Ortega changed the constitution to remove term limits on the presidency and has banned international observers, calling them 'shameless.' This summer he appointed his wife, [Rosario] Murillo, to be his vice presidential candidate and managed to remove the leadership of the country's main opposition group, leaving just five minor parties on the ballot. "Violetta Granada, the recently dismantled Liberal Independent Party's VP candidate, says this time Ortega has closed the door on the democratic process." The BBC reports that the opposition called Sunday's election, a "farce." La Prensa, the country's leading newspaper, declared victory for those abstaining from the vote. According to activists, the paper reported, about 70 percent of Nicaraguans did not show up to vote. Granada told the paper that the protest vote had won. "Ten years of dictatorship has been unable to defeat the sense of civic duty of those Nicaraguans who decided not vote. Our monitoring shows that almost 80 percent of the population did not vote.," Granada told the paper. The government, however, disputed that calculation saying close to 66 percent of Nicaraguans voted. A year ago, Franci Machado started feeling really sick with nausea and vomiting. She went to the hospital and then again when her symptoms worsened a month later. Doctors told her she had thyroid cancer. And that she was two months pregnant. 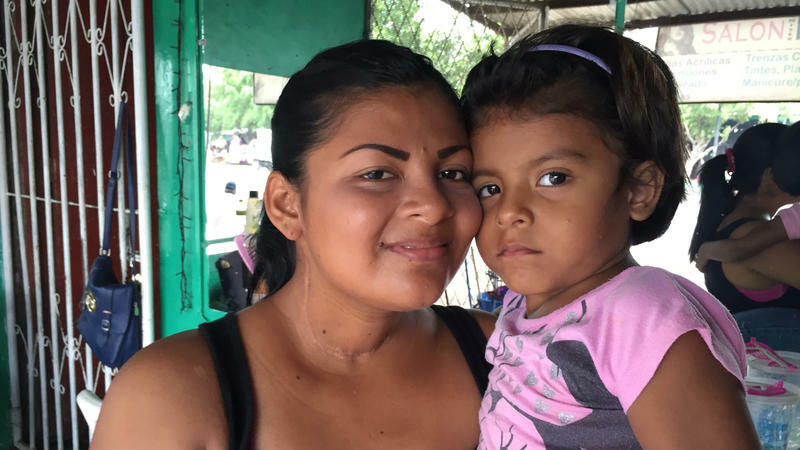 Machado, a 26-year-old single mother, needed chemotherapy to save her life, but that could kill the fetus. Under Nicaraguan law, that’s considered an abortion. So doctors refused to treat Machado.